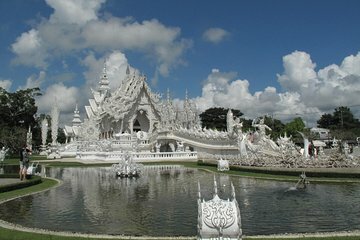 Faça uma viagem a Chiang Rai e veja a maravilha arquitetônica moderna de Wat Rong Khun (Templo Branco). Explore a antiga cidade real de Chiang Saen e faça um passeio de barco pelo rio Khong. O seu itinerário de dia inteiro inclui um almoço no restaurante e transporte de ida e volta a partir de Chiang Mai. Os números são limitados a um máximo de nove pessoas para garantir uma experiência de pequenos grupos com o seu guia profissional. Comece sua viagem de um dia com o embarque no hotel em Chiang Mai e suba a bordo de uma minivan com ar condicionado, partindo para a província de Chiang Rai. No caminho, o seu guia faz uma breve parada em Mae Khachan Hot Spring para uma pausa. Continuando, você visitará o Wat Rong Khun, de propriedade particular, conhecido como o Templo Branco. Admire a sua decoração única feita de vidro, peças esculturais e murais, todos desenhados por um famoso artista tailandês. Depois, siga para Chiang Saen, uma cidade ribeirinha repleta de ruínas de templos antigos. Ouça como seu guia compartilha a história do antigo reino tailandês. Em seguida, saboreie o almoço em um restaurante local especializado em pratos tailandeses ou em um buffet internacional - a sua escolha. Em seguida, vá para um mirante do templo para ver o Triângulo Dourado e suba a bordo de um barco de cauda longa para um passeio no rio Khong. Você chegará ao ponto em que Mianmar, Laos e Tailândia se encontrarão e fará uma parada em um vilarejo local de Laos (traga seu passaporte). Visite o Salão do Ópio, um museu privado no antigo comércio de ópio, antes de um retorno ao seu hotel em Chiang Mai. This was a great tour, except too long. 14-15 hour round trip starting at Chiang Mai. Maybe they can look at dropping one of the activities on this tour. Although the trip was long, we left the hotel at 7:15 a.m. and didn’t come back till past 9:30p.m., I would say it was worth it. The White Temple struck me as a moving testament to a man’s aspiration to immortalize his love of country through arts and to promote peace, understanding and unity among all nations.The Golden Triangle was a great lesson in history for me. Travel widens one’s mental horizon. If you can't handle 8+ hours a day in a car avoid this tour. The distance between Chiang Mai and Chiang Rai is 200 km (3+ hrs) one way. The White Temple is incredible, huge crowds, but the staff keeps you moving at a good pace (through the white temple). There are other temples and lots of shops in the area. Our bext stop was lunch approximately an 1hr 15min drive from the temple. Lunch was brilliant, especially the soup. You can have as much food as you like and bottled water, but other beverages you pay for. Bathrooms were decent too, they had both options: toilet or hole in the floor. The opium museum was next (15 min drive away). Really interesting, but the Chinese tourists were en masse and obnoxious. Lots of shopping in this area and along the 5 minute walk to the long tail tour boats for the boat ride along the river and to the Laos market. Not alit if time to look around until the Laos market. The tour guide has to keep you moving or you will never stay on time. I am a boat person so i was comfortable in the boat and enjoyed the ride (approx 15 min), but some might find it difficult to get in and out of the boat. The river water can be very choppy. Seat in the middle to avoid getting wet. The Laos market was interesting to see, but avoid the washrooms!!! They are not maintained!! We didn't buy anything, but there is lots to purchase. Our guide warned us that everything is fake and to only pay 50% of the asking price. A quick boat ride back to Thailand and we had a few minutes to walk around the riverside and take pictures of the signs and monuments to the Golden Triangle. Really incredible experience to see all this. Another breif car ride to a Temple. Short visit and washroom break. Then a 3+ hour drive back to Chiang Mai, or longer depending on traffic. In summary, great trip, great tour, comfortable van, but too much time in the van. Also not enough time exolore the Golden Triangle area. But if you like to see this quickly and get moving you won't mind the fast pace. I would stay in Chiang Rai next time and visit from there. Picked up on time by our guide John and the driver Tom and we were on our way. A few quick stops to pick up the rest of the small group before heading out of the town. John explained the day and after a while we reached the first stop by the hot springs. It was OK, not fantastic but still a nice stop en route.Then the day continued. The White Temple was spectacular. Completely stunning artistry in every detail and so much to see. A must see if you have the chance. Then off for a delicious lunch at a local restaurant. The food was plenty and every bit of it tasty.The trip then took us up to the Golden Triangle with a visit to the Opium Museum and a short boat trip to the market on the Laotian side of the river. Quite interesting as well.Then time to head back with a short coffee break on the way courtesy of John, the guide.This is a long day out but well worth it. Loads to see and our guide John and driver Tom did an excellent job in making the trip a delight. Highly recommended. Amazing tour with an on-time pickup. It's meant to be a rushed tour given the sightseeing spots we need to cover in one day, but it's worth it to see the Golden Triangle and have a chance to see tidbits of Laos. I'd recommend it to anyone looking for a good, action-packed 1-day adventure. This is a LONG day - 13 hours of touring. Our guides were great John and Linda and kept things moving, as well as knowing the delicate balance of letting us sit in quiet. A trip to Laos, Golden Triangle, Opium Museum and the absolute amazing White Temple are all worth the visit! It can be incredibly hot at the white temple - but the guides were ready with cold water and wipes upon our return. The stop at the hot springs is pretty lame, but it did break up the long journey to Chiang Rai. Loved the White Temple. Well worth the travel time. Was extremely unimpressed with the Opium Museum and that should honestly be eliminated from the itinerary. Our guide’s English was extremely difficult to understand. In retrospect, I’d book another tour if the White Temple is your main goal. 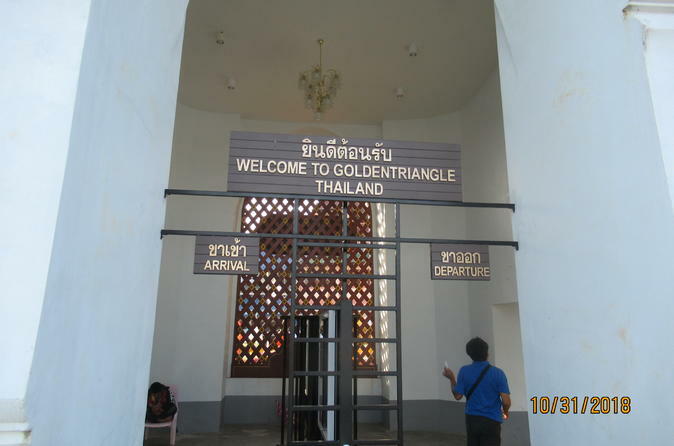 Nice trip to several places around Chiang Rai, especially including the Golden triangle area. Riding a small boat across the river to the border village of Laos was very interesting experience. The while temple was so beautiful. This trip is quite a new experience to us. Good for family trip. Tour guide is knowledgeable of the area, speaks good english and made sure that his guests are comfortable.